During the 2013 legislative session, duplicate bills—HB-369 and SB-368—were introduced to drastically overhaul the state’s tax system. The bills would have eliminated personal and corporate income taxes, lowered the state’s consumption tax to 2 percent, and added a 2 percent tax to wages and salaries. While a flat tax system such as this seems fair superficially, it would result in a more regressive state tax system that would weigh even more heavily on those New Mexicans with the lowest incomes. This legislation did not pass in 2013, but it is almost guaranteed to make an appearance in subsequent sessions—and it should be stopped. Eliminate the personal income tax and the estate tax. This would eliminate one of the only progressive state taxes, where low-income earners pay a lower share of their income than do high-income earners. Eliminate the corporate income tax. Company profits would not be taxed at all at the state level. 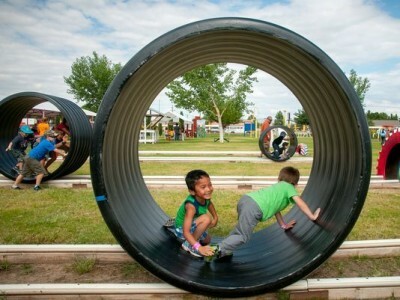 This would result in a loss of some $300 to $400 million annually in state revenue. Reduce the gross receipts tax. The GRT (the state’s consumption tax on most goods and services) would be reduced from 5.125 percent to 2 percent. (Cities and counties would be able to tack on up to an additional 0.5 percent each.) The bill would also repeal the current exemptions for food—even those purchased with food stamps—and some health care services. Reducing the GRT seems like a way to make the tax system more fair, since sales taxes hit low-income families the hardest. However, changing the tax rate will not change the ratio of GRT paid as a share of income. Low-income New Mexicans would still pay almost four times as much of their incomes in GRT on goods and services than high-income New Mexicans under this new system. Add a flat 2 percent tax on wages and salaries. Taxing all wages and salaries at the same rate would remove all progressivity from the tax system. To make matters worse, some forms of unearned income would not be taxed at all. Capital gains income, 90 percent of which goes to the top 10 percent of New Mexico tax filers, would not be taxed. Income from rents, royalties, and partnerships would not be taxed. All of this would disproportionately benefit those with the highest incomes. Eliminate refundable tax credits for low-income filers. The Working Families Tax Credit and the Low-Income Comprehensive Tax Rebate are two refundable tax credits designed to offset the regressive nature of the state’s overall tax system. They would be replaced with a Low-Income Tax Credit that would return less money to low-income filers. For example, a family of three living at the poverty level would experience a net loss of $300 under this new tax credit. 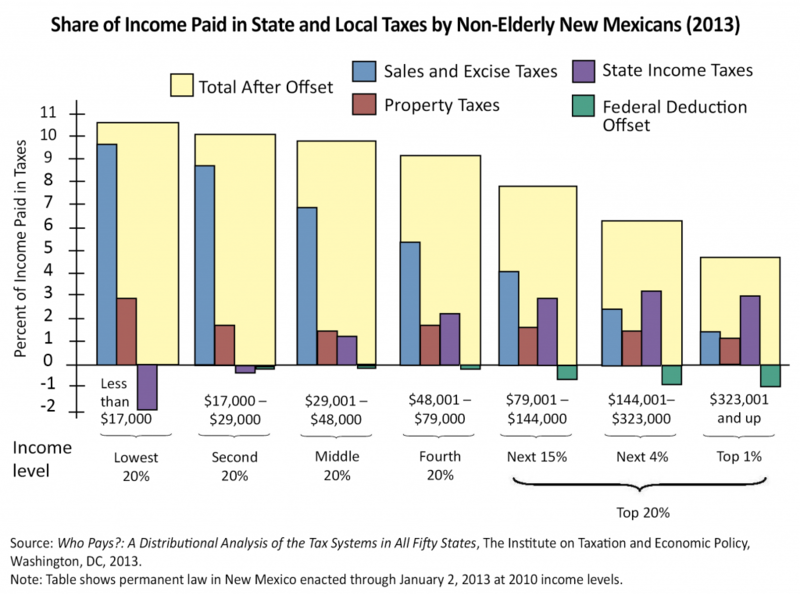 New Mexicans in the bottom income brackets already pay a higher share of their incomes in state and local taxes than do those in the top income brackets. The yellow bars in the graph below show the share of income paid in state and local taxes by each income level. The various types of taxes are illustrated by the blue, red, purple, and green bars. The blue bars—representing sales taxes—are by far the most regressive. Even though the purple bars—representing state income taxes—represent a net gain for low-income New Mexicans, it is not enough to offset the overall regressivity of the other taxes. A flat tax system like HB-369/SB-368 would result in an even more regressive tax system. Furthermore, since the state’s Taxation and Revenue Department was unable to evaluate how these bills would impact state revenue, it is unclear if it would bring in enough money to fund necessary programs and services—like education, health care, and public safety—at their current levels. Given that New Mexico already has the highest rate of income inequality in the nation, the highest percentage of working families that are low-income, and the lowest ranking for child well-being, these kinds of bills should not be passed if they reappear in future legislative sessions.